God to Abraham: "It's all yours." 13:1 Abram and his caravan left Egypt and traveled to the Negev, in what is now southern Israel. He took his wife and everything he owned. His nephew Lot left with him. 13:2 By this time, Abram was rich with livestock, silver, and gold. 13:3 Abram left the Negev and started backtracking north toward Bethel, camping at different locations along the way. He eventually arrived at a site where they had camped earlier, between Bethel and Ai. 13:4 This was the same place Abram had built a stone altar and worshiped the LORD. 13:5 Abram wasn’t the only one rich. His nephew Lot had also gotten rich with livestock and tents. 13:6 Abram and Lot had so much livestock that the land couldn’t support the combined herds and flocks. There wasn’t enough pasture and water to go around. 13:7 Arguments broke out between the two men’s herders. This took place when Canaanites and Perizzites lived in the area. 13:8 Abram told Lot, “We’re family. There should not be any bickering between you and me or between your servants and mine. 13:11 Lot chose the entire Jordan River Valley, east of where they were camping at the time. And that’s where he moved. Abram and Lot parted company. 13:12 Abram stayed west of the river, camping in the fields of Canaan.2 Lot lived among the cities on the plain in the sprawling valley. He pitched his tents as far south as Sodom. 13:13 The people of Sodom were a poor excuse of human beings. Terrible sinners against the LORD. 13:14 After Lot left, the LORD said to Abram, “Take a look around you. Look in every direction: north, south, east, west. 13:15 It’s all yours. Every bit of land you can see is yours. I’m giving it to you and to your descendants3 forever. 13:16 I’m also giving you more descendants than you would be able to count—that’s assuming you can’t count every speck of dust on the planet. 13:18 Abram got on the move and eventually settled in Hebron, near a grove of trees4 owned by Mamre. There, he built another stone altar and worshiped the LORD. Location unknown. Many speculate the cities were near what is now the southern shallows of the Dead Sea, and that before the land flooded it was a fertile plain in the southern Jordan River Valley, with streams flowing north into the Dead Sea. When the herds and flocks of Abraham and his nephew Lot got too large to graze together, the two men agreed to part company. Do you think it’s fair to read anything into the character of Abraham and Lot, based on the report that Abraham gave his nephew first choice of the land and that Lot took the best grazing fields, leaving his uncle in the Judean Hills? Bible experts seem divided over where Lot took his livestock. The Genesis writer reports that “Lot took a good look around and saw that the Jordan River Valley in the direction of Zoar looked like the perfect place” (13:10). But no one seems sure about where Zoar was. Some speculate that Lot settled north of the Dead Sea. But the most popular theory puts him south of the Dead Sea in what is now a pretty barren badlands. What have you read or heard about where Lot settled? Abraham settled in the city of Hebron in what is now a predominantly Palestinian city in the West Bank. 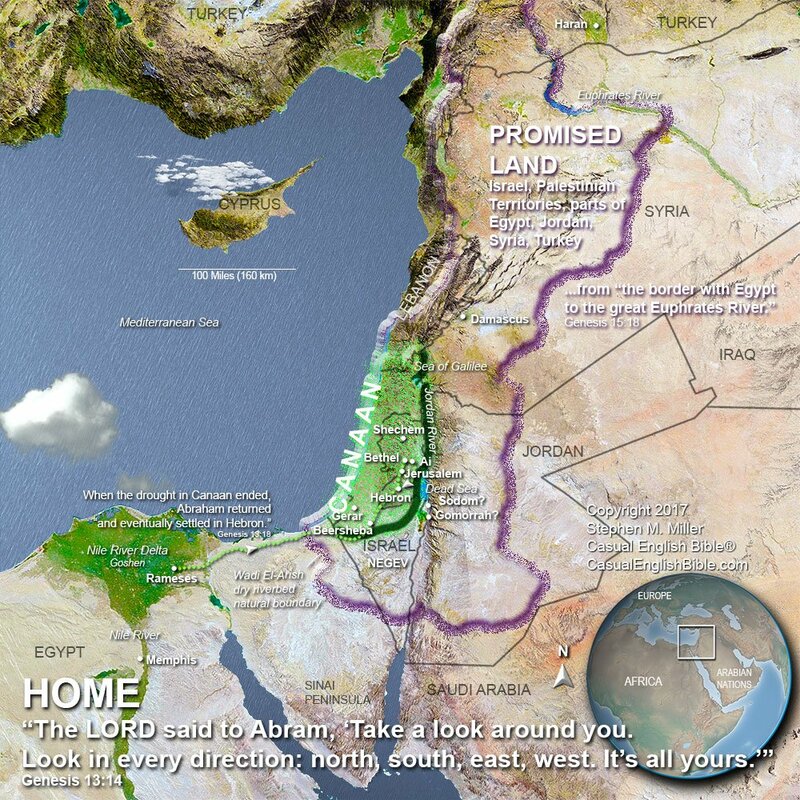 It might seem a little ironic that this is where God once again promised Abraham: “Take a look around you. Look in every direction: north, south, east, west. It’s all yours. Every bit of land you can see is yours. I’m giving it to you and to your descendants forever” (13:14-15). Do you think God honored that promise, given the fact that Jews and Arabs both claim to descend from Abraham—Jews from his son Isaac, Arabs from his son Ishmael? Or is it a promise yet to be fulfilled? LIFE APPLICATION. When have you seen someone settle a dispute in a way that’s similar to the gracious approach Abraham used with his nephew Lot?